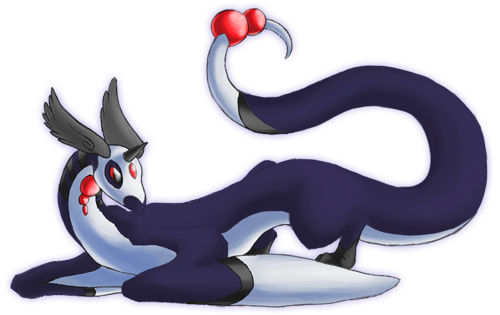 Pokédex Entry-This dragon is nocturnal by nature. It attacks silently under the cover of nightfall, the only sign that it approaches is the glowing orbs on its body against the black sky. Evolution Method-Level up at night at level 55 holding a dark sphere. High special attack, Moderate high special defense & defense. Moderate high speed. Everything else is normal. User Note- They're often misunderstood, thought to be bringers of death and bad prophecies. Their orbs glow with a crimson light, much like dying stars in the distance. They're thought to be rare by humans. They were often hunted out of fear, so the clans have learned to stay away from people. They fly mostly at night, hunting over water and shores. They have large wingspans, but no forearms. They can fold up their wings and walk on all fours, albeit a bit clumsily. Their hind feet have powerful talons on them though, which they use to grab their prey, much like eagles do. They can control the weather like their prevos, but not to the same extent, as their abilities moved more to the dark element. They're quite the special ATK power-houses, but since Dragonites are pseudo-legendaries, I figured they need to be super-powerful. Loosely based on the Night Fury from How to Train Your Dragon. 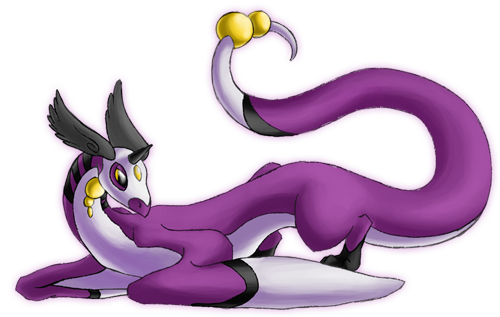 I pulled most of their attacks and stats from Dragonite, Dragonair and Hydreigon, which is the only dragon/dark that I know of. I also took out some of the attacks that require strong forearms, seeing as how this one has wings rather than arms. Less fighting type attacks as well and more dark type attacks. Also based on old-school versions of wyverns, with winged forearms.